Al Nafourah Garden at Oryx Rotana ... renovated. Oryx Rotana, a five-star luxury business hotel in Doha, Qatar, has completed all the renovation works linked to its Al Nafourah Garden project. Renovation work on the project has involved a new design, a brand new kitchen, and an elegant decor, all of which are expected meet the expectations of guests and travellers alike. In addition, a special covered area called the ‘pergola’ has been set up at Al Nafourah Garden to accommodate guests looking to enjoy the provided services throughout the year in a special ambiance. “We have worked hard to make improvements on Al Nafourah Garden, and these changes allow us to serve our guests all year round in the Pergola. 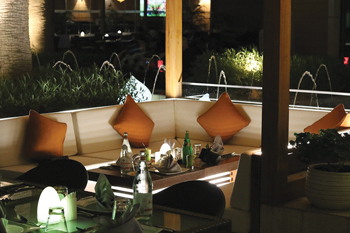 Al Nafourah Garden is a perfect combination of great Middle Eastern cuisine and outdoor seating,” he adds.